Format: double-sided bilingual DVD / 100 mins. / 4 eps. Comments: Still battling to save the world from the invasion of the underworld, Ronin Warriors becomes a bit more interesting. 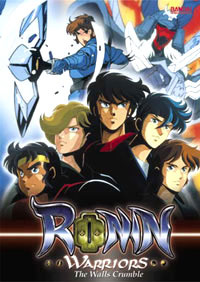 I must confess, at first, I didn't care much for Ronin Warriors. Each of the discs is put together rather well, with the original Japanese show on one side of the DVD and the English dubbed version on the other - both uncut. The packaging was attractive, and the show boasts some pretty good creative talent - including Yatate Hajime, the name of the crew of writers behind quite a bit of Gundam Wing and Cowboy Bebop, among other shows. However, it seemed like a show aimed primarily at kids, with its colorful heroes, exaggerated evil villains, and action oriented plot, and thus it didn't appeal to me. However, now that I'm nine discs into the show (and a few episodes into what must be the second season), it has become a bit more entertaining than it was from the start. The series is set in modern Japan and focuses on five young men that are each the reincarnations of ancient warriors. The Dark Lord Arago - master of the underworld - is stirring once again, and this time, he intends to remove the boundary between the world of the living and the realm of the dead in order to gain control of all reality. The only threat to his dominance would be the five Samurai Troopers (in Japanese, at least), each possessing a suit of armor bound with one of many human virtues. As we discovered in earlier episodes, however, the armor also has a dark secret, for each one was formed from the power of the underworld, as well. Arago designed the armor as the ultimate tool for him to secure his position as supreme ruler of everything before the forces of good stepped in and imbued them with virtues. That hasn't stopped him from seeking out ways to claim the power of the armors as his own, and with the apparently limitless resources of the underworld, it seems that Arago comes closer to success with each episode. There's quite a bit of reminding going on in this show. By that, I mean we're frequently told what happened "last time" in the series, and flashbacks are very common. When this is watched on TV, once a week, this probably works well to keep everyone interested in a complex storyline. However, when I'm sitting down and watching four episodes at a time, it seems as if half of the show is spent recapping what's already happened. On the upside, while this really is a show for young kids, there is an admirably complex plot and well-planned fight scenes. Also, the story is darker than expected, considering the target demographic. Events are not always predictable, and characters do undergo a greater degree of development than is typical for this kind of series. As a result, I find myself finally getting into a series that I thought wasn't for me at all, in the beginning. The animation for this series looks pretty much like it was produced when it was produced - long ago. There's quite a bit of frequently used animation sequences, such as when the characters don their armor. Depending on how much time needs to be filled in each episode, more or less stock footage is thrown into the show. Perhaps kids get a kick out of the characters powering up, but as an older viewer, it gets to be a little repetitive after a while. Fight animations tend to be well done, especially considering the type of show this is. Character designs seem a bit dated (every character looks like a girl), but they are distinct at least. Background elements are well-illustrated and easily stand out as the most visually impressive aspect of this series. Voice acting for the show sounds pretty good, though I have to question the choice of accents for the English dub. Essentially, it bothers me a bit that the Ronin Warriors (as they're known in English) speak with a Californian surfer accent. I suppose the dub studio wanted to capitalize on the popularity of the Teenage Mutant Ninja Turtles. Whatever the case, it's disturbingly out of place. Then again, the entire English dub seems aimed more towards young boys than the Japanese track, and as such it comes across as quite a bit more corny. Extras for these discs are nonexistent, especially since I don't consider the inclusion of the Japanese language version of the show as a bonus. As far as I'm concerned, it should be mandatory -- not an option. I get a kick out of the fact that Bandai has doubled the running time of the DVD since it counts Ronin Warriors and Legendary Armor Samurai Troopers as two different shows rather than the same show with different spoken languages. Unless you're the kind of person who likes to watch every show twice (or you're reviewing the show for a magazine), then you're not likely to watch 200 minutes of this DVD all at once. Most people will probably just watch the subtitled version or the dubbed version - not both. However, since Bandai has put some effort into keeping the two versions of the show separated (since they're on opposite sides of the DVD), I suppose they have some justification in doubling the running time. I just feel I have to warn potential buyers about this detail - when they say 200 minutes, there's still only four episodes in the set, not eight. My house was broken into last October and three of my Ronin Warriors DVDs were stolen (along with thousands of dollars of video game equipment), and when I first got into the show, I probably wouldn't have bothered replacing them. However, as the story has become more fun to follow, I think I'm going to fill in those gaps once again and repurchase the discs after all. I guess it's a good thing The Right Stuf is having another crazy sale - and this month, it's for all of their Bandai stuff! This show may not be for everyone, but if you give it a chance, it will eventually grow on you. However, not everyone can afford to give a series with more than ten DVDs a chance, so perhaps you should rent this one before purchasing it. Still, for slightly formulaic supernatural samurai action, it's not half bad after all.